LOS ANGELES-Arizona State kept hanging around the USC football team Saturday afternoon like a fly waiting to pounce on a piece of food. Saturday evening that fly bit into that piece of food and came away happy and full. Yes, the same Arizona State that got waxed a week earlier by the Bruins in Westwood, got the better of the Trojans in what was supposed to be an early season Pac-12 tuneup for USC, recording a 38-34 road win behind a backup quarterback and a Hail Mary pass that looked more like a wayward balloon sail than a game-winning touchdown throw. The same type of play that the Trojans reveled in last week in their defeat of Oregon State at the Los Angeles Coliseum came back to haunt them against Arizona State. 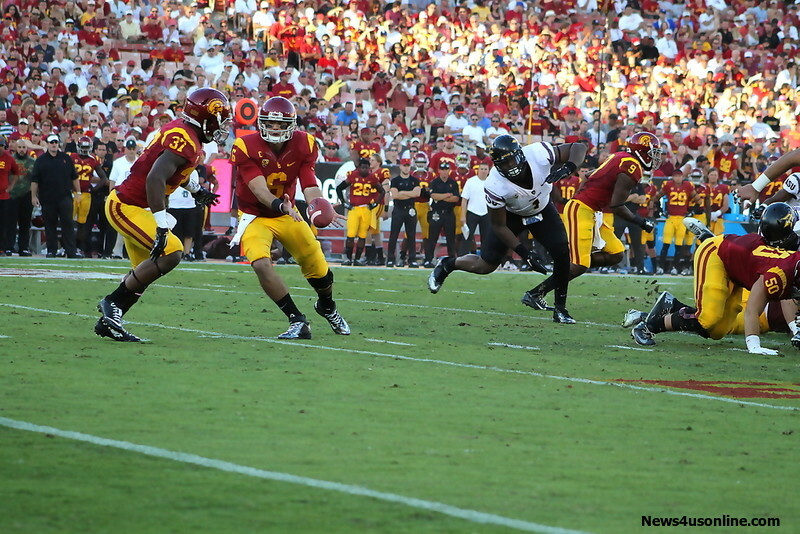 Last week, USC’s Cody Kessler unleashed a 48-yard heave for a touchdown to Darreus Rogers in the Trojans’ 35-10 win. This time around, as the nation now knows, wide receiver Jaelen Strong, who had been a thorn in the Trojans’ side all game, snatched defeat out of the air when he caught quarterback Mike Bercovici’s last ditch, 46-yard throw in front of several USC defenders to give the Sun Devils a very unlikely win. As far as the Trojans are concerned, any chance of USC possibly competing in the newly formed FBS championship playoff format just got tossed out of the Southern California window. Good night and good luck. That No. 16 ranking the Trojans had stamped on their backs before going up against Arizona State just left the building with every bit of Bercovici’s 510 passing yards the backup QB had against them. The college football madness this weekend didn’t just topple the apple cart; it busted the gates wide open as one Top 25 football team after another got bit by the upset bug. Unfortunately for the Trojans the bite they received is going to take a lot out of them. Already in a vulnerable position after enduring a 37-31 road loss to Boston College a couple of weeks ago, the Trojans’ title hopes just could not stand another defeat. The 6-foot-3, 215 Strong and Bercovici handed it to them. 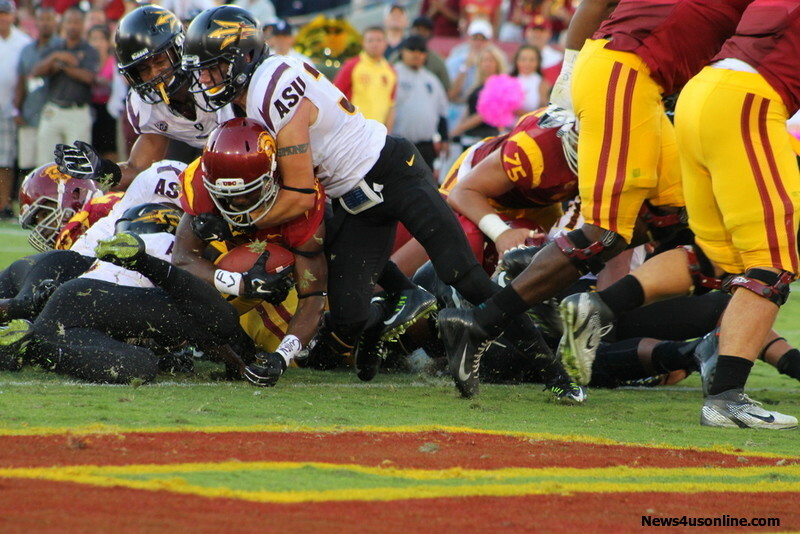 Bercovici threw five touchdowns. Strong went Megatron on the Trojans, catching 10 balls for 202 yards and three touchdowns in Arizona State’s wild victory. 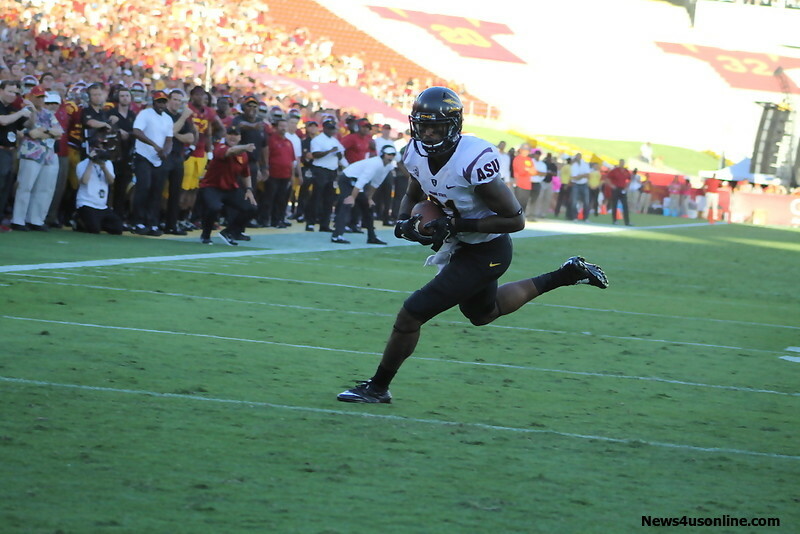 What was overshadowed in the Sun Devils’ improbable win was the performance turned in by USC running back Javorius Allen, who pounded Arizona State’s defense with 143 yards and two touchdowns on 29 carries. Ironically, Allen scored the Trojans first touchdown of the game. He would also score the last-on a 53-yard run to the house to give USC a 34-25 lead late in the fourth quarter. Even more of a coincidence is that Strong (TD catches of 4, 77 and 46 yards) would do the same for Arizona State. The shootout that turned out to be between the two teams over the last two quarters seemed unlikely in the first half. The first periods looked and felt like this was going to be a grind it out type of ballgame. Besides Nelson Agholor’s 53-yard punt return in the first quarter, USC didn’t do much offensively until it managed to put up 10 points late in the second period to walk into halftime with a 17-15 lead. The Black Mamba is Back…are the Lakers?